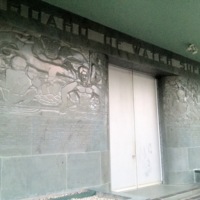 Building entrance - makai side - with sculpture mural by Margarite Blasingame. Depicts discovery of water by gods Kane and Kanaloa. Mike de Lange, “Art at Honolulu Board of Water Supply - Public Service Building,” Hawai'i Modernism Library, accessed April 21, 2019, http://docomomo-hi.org/items/show/965.